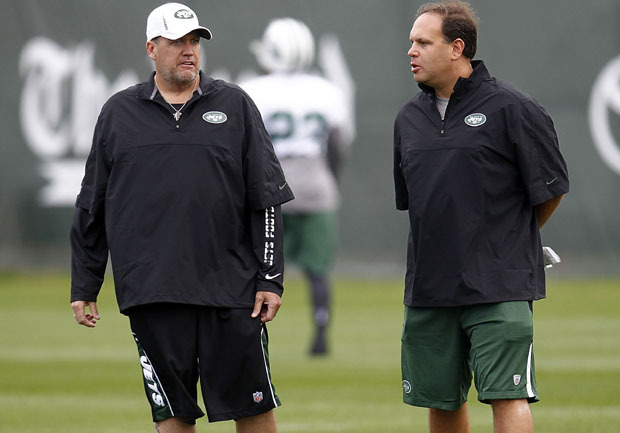 FLORHAM PARK, New Jersey The New York Jets have fired general manager Mike Tannenbaum and say coach Rex Ryan will be back next season. The Jets finished 6-10 and were in constant turmoil from the moment they acquired Tim Tebow in a trade before the season. Jets owner Woody Johnson said in a statement Monday that "like all Jets fans, I am disappointed with this year's results." Tannenbaum, who signed off on Tebow trade, has two years left on his contract. Tebow was brought in as a backup for Mark Sanchez but was expected to play a key role in certain offensive schemes. It never worked out. CBSSports.com's Will Brinson says it's hard not to agree with Johnson's assessment of the situation. "The Jets were the NFL's circus, a quarterback-lacking sideshow that didn't fail to deliver the drama week in and week out, even if it lacked a lot in terms of actual football being played," Brinson writes. "Tannenbaum, for as crafty as his cap manuevering might have looked during the two years the Jets made the AFC Championship Game, made a slew of errors pushing money into the future, namely sinking a pile of guaranteed money into quarterback Mark Sanchez."